I once had a co-worker proudly boast that she had been doing the same Jane Fonda VHS step workout everyday for years. Yet, in the same conversation, she said she couldn't understand why she wasn't progressing in strength and cardiovascular gains. She wasn't interested in what I had to say, but the solution was an easy one - change up your workout routine! Your body becomes accustomed to certain training programs when you do the same routine regularly, which is known as adaptation. As your body adapts to the stress of a new program or exercise routine, the workout becomes easier to do. Think about some workout program or move that made your really sore when you first started it. As you did it more and more, the soreness decreased and it became easier. If you want to have the best possible results, you need to vary up your routine. When clients are first beginning a workout program, I think they need to allow themselves around 6 weeks to get used to a workout regimen. However, after that, they should start varying up their program. There are so many different formats to help you change up your workout. You can include some intervals, try a circuit workout, add new strength moves or take a class! 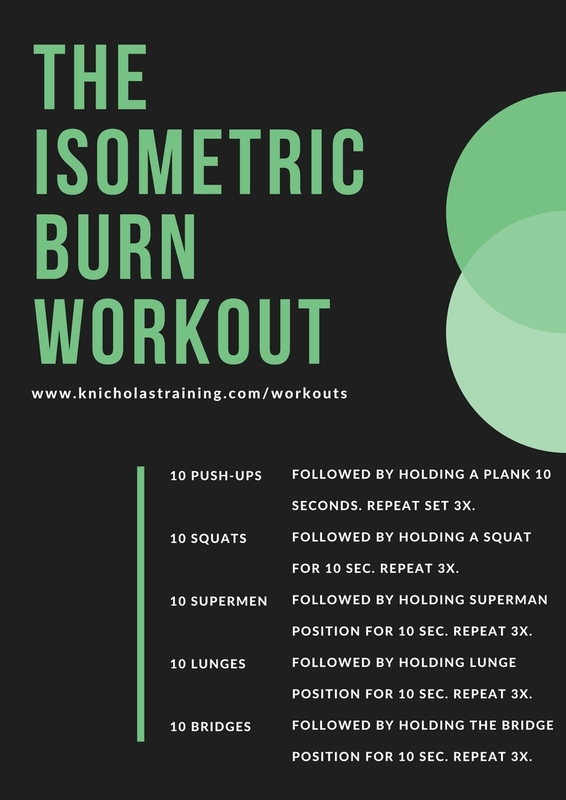 Checkout my workout gallery for a number of sample workouts that utilize different formats - www.knicholastraining/workouts. I'm also including a sample workout below that features a format that is easy to incorporate into your daily workouts. You don't have to completely overhaul your fitness program, just make sure you have some variation. Directions: Complete the 10 reps of the listed exercise and then hold the isometric position for 10 seconds. For example, you will complete 10 push-ups and then hold the plank. After planking, I try to go directly into the next set of push-up repetitions. I feel like it's more challenging; however, you are always welcome to break if needed! 10 Push-ups followed by holding the plank position for 10 seconds. Repeat 3 times. 10 Superman followed by holding the Superman position for 10 seconds. Repeat 3 times. 10 Squats followed by holding the squat position for 10 seconds. Repeat 3 times. 10 Lunges (per leg) followed by holding the lunge position for 10 seconds. Repeat 3 times. 10 Bridges followed by holding the bridge position for 10 seconds. Repeat 3 times.